Thank you for visiting our web-site. Choosing our writing services is a smart decision. Therefore, we would like to take a moment to introduce ourselves. Not just anyone can be on the WayWriting staff. To ensure excellence, we only select the most qualified professionals, well versed in all variants of academic writing - such as humanities, technical sciences, arts, and many more. Regardless of your topic, there is a writer on our team who can cope with your order. Also, we are continually working on the skills development of our writers to keep up with the growing demands of our clients. Our every writer undergoes strict testing before working with us. Therefore, we can make sure that each professional on our team knows all the ins and outs of various paper types and formatting rules. Also, we use only relevant information and reliable sources so that your paper is not "outdated" and has scientific or educational value. Our papers are prime examples of a properly written academic work that you can use to develop your own skills. We do not tolerate missed deadlines. Your paper will always be delivered within the indicated time frame, and that is a guarantee. Our team works on a 24-hour service schedule, so leave any worries about urgent requests behind. Attentive managers are always ready to take your orders and answer any questions about the writing process, pricing policy, and other aspects of our service. All our papers are 100% original. We never reuse completed orders. We guarantee the authorship of every research paper, speech, thesis, essay or report because we value our reputation and your success. Absolute customer satisfaction is what you get when ordering from us. With our help, you can obtain a masterly written paper that meets your requirements, deadlines, and expectations. 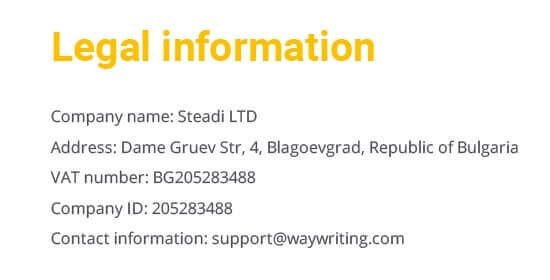 Place an order and discover why WayWriting is your best shot at dealing with academic problems.